The backers of the ballot initiative to “restore balance” on San Francisco’s streets are beginning to emerge. The “balance” they speak of would enshrine free parking and give over large parts of streets to cars. According to the list of endorsements posted on its website, the “coalition” (which apparently dropped its “Free the Streets” title) is thus far populated by hefty amount of Republicans — yes, a few do exist in San Francisco. There are also three former supervisors, but no current elected-office holders. And, of course, the list is speckled with some of the usual opponents of parking meters and bike lanes, whose names should ring bells. It’s hard to say yet whether any of these folks have any real political punch. The measure itself does not seem to — it wouldn’t be any more binding than the existing Transit-First Policy, adopted by supervisors in 1973 and re-affirmed by voters in 1999, when they expanded the policy to include pedestrians and bicyclists. Since the vast majority of San Francisco’s street space was devoted primarily to moving and storing private automobiles, all for free, over most of the 20th century, most San Franciscans can probably see that more “efficient to use” streets won’t involve more of the same approach. (Notably, the cover photo on the initiative’s website even features a streetcar on Market Street — pretty much the opposite of the actual car-clogged vision these folks are pushing). Stephanie Jeong is on the SFGOP Central Committee, FWIW. Odd to see so many Republicans opposed to ending government subsidies (i.e. for automobile storage). This reads like a veritable who’s who of the NIMBY “I’ve got mine, screw you” community in San Francisco. 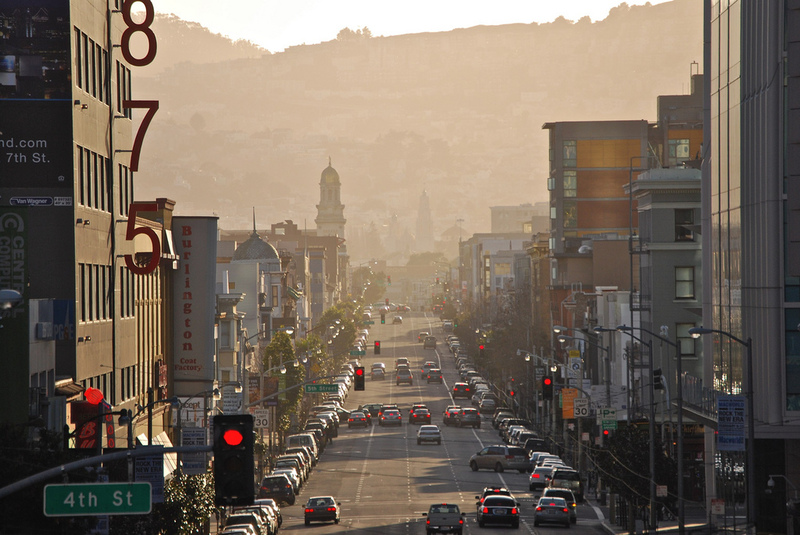 If there’s one thing that both old-line progressives and republicans can agree on is that the San Francisco streetscape and housing stock should be preserved in amber at about 1988 – right before the population started to expand after three decades of decline and the Loma Prieta earthquake hit. Surprisingly, though, those same people don’t want to bring back the crime rate, lack of jobs, and miserable retail opportunities that existed at that time…. As a regular reader of this blog it seems that Republicans/Conservatives are almost always against public transportation initiatives as well as street improvements for pedestrians and bicyclists. Not just in San Francisco but across the entire country. Why are they so car-centric? I honestly don’t get it. Rob Anderson is backing it. Enough said. @RD There’s a difference in worldview. Progressives tend to favor collectivist policies and public engagement, while conservatives want policies that enable people to avoid the scary “other.” Hence cars and sprawl vs sidewalks, bikes, transit and density. Richard Hall is a driving force behind Citizen Marin and Marin Against Density (MAD), two anti-development activist groups in Marin County. He’s a Randall O’Toole acolyte. You can read his blog, Planning for Reality, for his views on transit (causes more GHGs than cars), bicycling (should get as much money as it has mode share, though just try to tell him mode share is high anywhere), and regionalism (social engineering from greedy bureaucrats in Oakland, roughly). The exceptions are fantastic, though. Charles Marohn of Strong Towns, the greater Salt Lake City area… can’t think of any more. As a long time libertarian (though I admit not a member of the LPSF), and a 20-year cyclist commuter, I’m writing to take issue with your support of the “Restore Transportation Balance” initiative, in an attempt to persuade you that it is not, in fact, in accordance with libertarian principles, and to urge you to rethink your support. At present, our society heavily subsidizes the use of cars, through zoning that increases the cost of housing by requiring parking construction; through taxes that heavily subsidize highway construction; and through tax breaks for resource exploitation. Not to mention the fact that we allow private citizens to store their cars, for free, on public land, by failing to charge for private parking on public streets. In a dense urban environment, such as San Francisco, street space is at a premium. Particularly downtown, and particularly during rush hours, far more people can be transported down a street, in a particular length of street, by public transit than by private motor vehicle; far more can walk in a given square footage than can be transported by private motor vehicle; and far more can cycle than can be transported by private motor vehicle. In a rational society, all of these things — mass transit, walking, cycling — would be given priority over private cars. Our society, of course, is not a rational one; the market does not rule, and instead priorities are set by the state. And since the 1950’s, the state’s priorities have emphasized private cars over every other form of transportation, to out detriment. Efforts to support the priorities of pedestrians and cyclists over those of car drivers are not antithetical to libertarian beliefs; indeed, the dovetail with them nicely. Drivers, operating multi-ton heavy machinery that can easily kill or maim, should be subject to severe penalties should they do so; and the onus of safe operation of their vehicles should weigh heavily on their actions. Streets should be prioritized for pedestrians and cyclists, who pose little danger to others, and who use the limited space of our crowded city far more efficiently than other modes of transport. There is a reflexive impulse on the right to support drivers at the expense of other forms of transportation, because driving has, since the 1950’s, become the norm, and because ‘conservatism’ inherently implies an impulse to protect and defend things as they are. But libertarians as not ‘conservatives,’ in this sense of the word; we do not believe in conserving the past, but in promoting individual liberty, whether that mean retaining some things or wholesale changes to things as they are. What is more libertarian than the cyclist, using his or her own motive power to move themself about the city, sometimes fearlessly defying the danger of motor traffic? What is more emblematic of individual empowerment that throwing your leg over a 25-pound frame, and taking yourself where you want to go? We are all, of course, regardless of our choice of transportation, individuals. And our choices must be respected. But those of us who chose to walk are too often injured or maimed by those who chose to drive; and those of us who choose to bicycle find ourselves second, or third, class citizens on our streets, and risk injury as well. In other words, San Francisco’s drive to improve conditions for pedestrians and cyclist is, in fact, a drive to promote individual liberty; not a constraint on it, except to the degree that constraints on people operating machines that can kill should be reasonably constrained. I urge you therefore to reconsider your support for this noxious measure. Let’s restore balance. Build a city-wide connected network of protected bike and walking paths! I am less sanguine than you, Aaron, that a pro-parking/easy driving initiative will go down to defeat. There are so many motorists frustrated with traffic and parking, and they tend to think the city simply needs to build more parking and devote more lanes to moving car traffic, as well as keep the city from becoming more densely populated. Of course, that is a dead end for affordable housing and freedom of movement, but they are not thinking in depth. They are grasping to maintain a nostalgia-tinted past and a stressful present. But nostalgia and fear of the future are powerful political forces. In the privacy of the ballot box, many voters may vote to maintain their free parking. Look at Palo Alto neighbors near the downtown or Marinites advocating against Transit Oriented Development near Larkspur’s Ferry a Terminal for this movement of keeping “their parking” and their former ease of movement via car on local streets and highway 101. I fear this initiative could embolden NIMBYs and retard necessary changes to our streets and neighborhoods. I look at it depends on what the bosses at the big corporations want. If they envision traditional male-female family living in a suburban single family home, drive SUVs or pick ups, eat genetically engineered food, shop at Walmart, and attend evangelical mega-churches, things like urban lifestyles, non-traditional families, cultural diversity are essentially threats to their vision and anything that helps to promote those “threats,” including transit and affordable housing, should be fought hard. Utah in a way is an exception mostly because of Mormonism and that the Mormon Church has a broader international reach (Some of the prominent white Americans who can speak the Chinese language are Mormons for example) and so are no stranger to transit and urban lifestyles, despite otherwise very conservative on pretty much everything else. @voltairesmistress:disqus I’m with you — while many of these names are not familiar to the younger readers, they represent a not-insignificant contingent of San Franciscans who think things were better back when they didn’t have to think very hard about things like pedestrian deaths or climate change. And they are people who still wield some political clout. You really need to think of a better name than “motorhead,” as pointed out previously. How about “Car Junkie?” Auto-maton? I vote for “Spewhogs.” Cars spew out noise, CO2, and cancer and asthma- causing agents, externalities that are imposed on everyone else. (Electric cars spew, but less, and at a distance, wherever the fossil fuels are burned to create the electricity.) Cars hog public space and taxpayer dollars, and like hogs they are smelly and can be quite dangerous to be around. I don’t think we want to rule out all motors–if we could get half of our senior citizens to tool around on adult electric tricycles with their dinky little motors, this city would be transformed overnight. Nah….time on the earth is really too precious. Just be assured from a 30-second once-over of that grammar-, mechanics-, and content-error-riddled piece of junk that you’ll have no hope of reading anything even remotely rooted in facts. What about dropping this nonsense of name calling and insults, and discussing the issues, important as they are, without these displays of rage or disparagement? I think this is just a case of misplaced association, Many people opposing biking lanes or sidewalk widening, among other projects, are on the 2nd half of their natural lives, many face the pressures of raising rents, and see the usual intergenerational cultural conflicts that happen anywhere to be compounded by real estate pricing crisis. So they reflexively associate cars with a past they are fond of, one of cheap housing and relatively easy way to live a laid-back life that is very hard to attain in the city nowadays. Bringing back “free parking” won’t help much more than bring back payphones, VHS players and disco music on radio would. This is a gross oversimplification, both of the political spectrum and the transportation policy. Public transportation projects are a low-hanging fruit on the political cheapskate cross-fire these days. It is an easy target for the anti-government post-Tea Party crowd (not only them, but the ones that shifted position to accommodate their views), and it makes an easy pick as a “minorities only” program that should be attacked in a broad context of political brinkmanship. Note, however, that the fastest expanding transit system in the country, among metro areas, right now, is in Salt Lake City. Not exactly a city known for a lopsided Democratic control. In any case, I think there is a process of emulation going on San Francisco: the older middle class is being hollowed out, and it clings to cultural symbols and make a great deal of preserving them as a way to “resist” what they perceive are people coming, taking over “their” place and making the city expensive and culturally less friendly to their tastes. So this is a good target for the “cars are for working people, bikes are for snob hispsters and Google buses are for entitled techies” discourse. It is a similar process by which people resenting demographic shifts pick upon the designs of new buildings as their rallying point, as if glass and steel towers were something inherently evil, when these NIMBYs are in fact looking at them as symbols of undesirable – for them – changes. This ballot initiative is nothing but “transportation balance,” delusion BS on steroids as it does absolutely nothing for pedestrians, cyclists and Muni riders and does everything in THEORY and DELUSION for those who must drive and park and in REALITY proves the opposite of its intent! Not all electricity is derived from fossil fuels, and some electric cars are used to cary more passengers per volume than many Muni buses. Nor do all cars park on public property. I truly don’t understand why anyone in SF would promote development in Marin. Two of the best things about San Francisco are its dense development, and proximity to unpopulated Marin County. Increasing population density in Marin will spoil qulity of life for San Franciscans. Build another 1 million units of Housing in SF, and 5 million units between Fremont and San Jose, but stabilize or reduce population density in Marin, Napa, Sonoma, and Santa Cruz counties. Their balance seems very imbalanced. They tend to be rural, or at least suburban. Where is the none of the above option? This proposal stinks and the current “transit (bikes) first” SFMTA/SFBC run policies stink. Time to grow up if you expect to be taken seriously. It really does not matter if the people listed as supporters of this measure take anyone seriously. They are the ones being more marginalized with each passing year. Because the people who do not agree with their perspective keep growing up and becoming able to vote, and they, well..
That option is in Phoenix. @andrelot – Your “undersimplification” doesn’t account for the GOP embrace of cars and sprawl. @Sanforida113 – Marin is not unpopulated, and the population it does have is mostly driving. The SMART project, which this group has reprised Glenn Beck yammering points about, only targets the corridor where most of the cars are. @yermom72 – Back when Ken “Kenny G.” Garcia was writing for the Chron and calling bicyclists “spokeheads,” the retort that instantly popped into my head was “exhaust-huffer.” It explains a lot about the cognition involved. @Greg – The SFMTA is following transit-first (bicycles and pedestrians included) policies that were mandated, twice, by voters. Only wingnuts attribute that to the SFBC. @p_chazz:disqus – Yes, time to put away childish things and turn to adult pursuits like anonymous sour blog comments. If we really want to counter the motörheads, we’ll need some umlauts. We can be gröwnup adült spökeheads or something. Bike lanes and crosswalks aren’t what curtails freedom of movement for drivers. It’s all those buildings taking up valuable space that could be used for roads and parking lots. Let’s start knocking those down, because FREEDOM! Are you referring to Kenny G’s cognition for calling bikers “spokeheads” or your cognition for instantly retorting “exhaust-huffers”? First of all, Octavius was promoting high-density development in Larkspur. Even if you denied the new residents parking, this would still result in many more cars and less open space along the bay near GG Ferry terminal. Regarding SMART, it stops in Larkspur, so doesn’t accomplish either connecting to BART, nor make it to SF. If Marinites want to fund the hobby project out of a special local property or sales tax assessment, then that is their prerogative. However, any regional, state or federal money wasted on that instead of BART, Caltrain or Muni is obscenely wasteful and counterproductive. Pretty sure no one ever voted on the bike plan. Wow, way to try to shame people. Lets list people who disagree with us, then try to shame them and sling mud on their name so no one takes them seriously? You would not feel the need to resort to that tactic if you truly believe that the petition/initiative has no support or merit. When 79% of households in SF have registered autos, and every anti-car measure is trumpeted as having “widespread community support”, something just isn’t adding up. Speaking of balance, how many people were killed while driving in SF last year? And how many killed by those driving? Can we restore balance there? @timsmith – GOP = Gas, Oil, Petrol. The corporate welfare enjoyed by these particular benefactors doesn’t count as big bad gummint subsidy, because lobbying.